A great Laced With GRACE Give-away! To find out more about the book itself, please visit our very own Lori from Lori’s Reflection. She read the book so she can share her thoughts with us: Fearless by Max Lucado. Please leave a comment on Laced with Grace for every entry you make. The giveaway will end next Tuesday, September 15th (midnight – EST) with the winner to be announced on Saturday, September 19th. This entry was posted on Wednesday, September 9th, 2009 at 10:48 pm	and posted in Give-away, LWG. You can follow any responses to this entry through the RSS 2.0 feed. I did a review of this book on my blog tuesday. Girl, I wrote a post about how you and others prayed for me for TT. I hope you have a second and can read it. Thank you somuch for your words to the Father for me. I love you. I can't wait to see you in a few weeks. Hugs. Thank you for posting about this book. 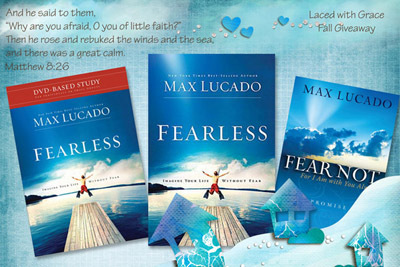 I love Max Lucado's books so went out today and bought this at Sam's .. Since I've become a widow I seem to seek God for things I have needed help with for years. i really don't know if there has been much change in me in the past 2 years but i trust that to God who helps me change. Looks like a great read to address an even greater need–our fear. I am back to normal. Please call your mother and thank her for praying for me. I am deeply humble and thankful.